The Moustache Lundi 26.3 is a an iconic and timeless classic, and features once more in the 2018 lineup. It’s fair to say that once in a while, a certain e-bike comes along and makes a huge splash! That’s the Lundi 26.3. It’s unmistakable design make it the most famous within the Moustache range. It features an exclusive Aluminium 6061 T4 T6 frame. It comprises a triple cavity down-tube, making it stiff laterally, stable and absorbing vertical vibrations. The Lundi’s impeccable look is aided by cable integration and a front light that is fully embedded in the head-tube. Signature Moustache alloy tubular mudguards are super-stable and define the brand also. Undoubtedly, the Lundi 26.3 is all about style and comfort, all in one. The world famous Moustache raised handlebar offers an upright and secure position. A suspended seat-post to absorb shocks and wide forgiving Selle Royal Hertz Gel saddle really add to the experience. Schwalbe 26×2.35 balloon tires absorb every bump and hollow. There’s no need for suspension forks on this gem! Designed for easy on and off, the angular open frame is easy to step through. The rear rack comes ready to accept any ORTLIEB pannier, the world’s best, with integrated QL3 mounts to attach Moustache ORTLIEB panniers in one click. The frame lock under the seat-stays allow the bike to be secured when left unattended and prevents opportunistic theft. Powered by the super strong Bosch Performance motor and combined with a large 400Wh battery, the Lundi 26.3 is both dynamic and powerful. Riding is a joy. The geometry is ultra comfy and provides the rider with a straight back and better visibility. The frame itself has strong lateral stiffness, and the precisely made 6061 T4 T6 aluminium fork ensures a soft yet responsive feel. Powerful and progressive Shimano hydraulic disc brakes ensure safe stopping. Gear shifting is effortless thanks to a Shimano Deore 10-speed derailleur. Hills present no challenge to this fine beauty. 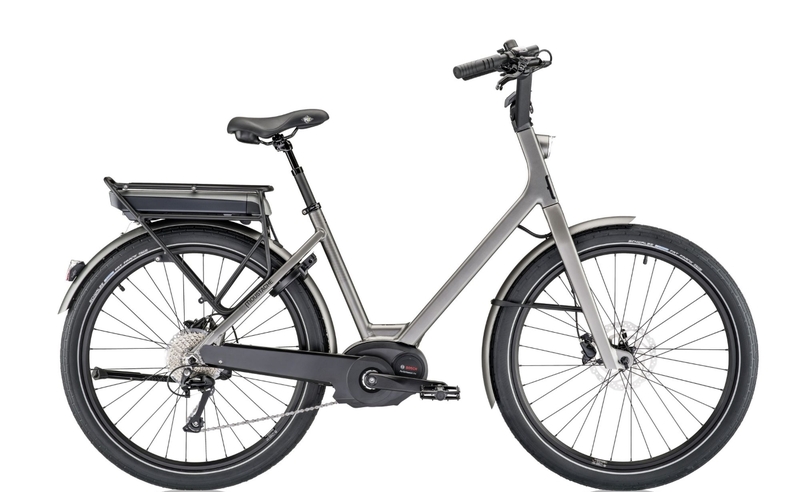 In addition, the Lundi 26.3 features an efficient and stylish integrated front light, and bright rear lamp. The unique angular frame exclusive to Moustache, ergonomic handlebars and tubular mudguards make this touring dame a real eye-catcher. Its highly pleasing performance is matched by its carefully designed frame to produce a superb riding experience that doesn’t go unnoticed. The sumptuous Schwalbe Fat Frank tyres with puncture-resistant lining complement the Lundi’s angles, and blend perfectly. The low centre of gravity produce a very stable ride, and make cornering and turning a breeze. Available in black, titanium, white, petrol, red & green. Black, Titanium, White, Petrol, Red & Green.